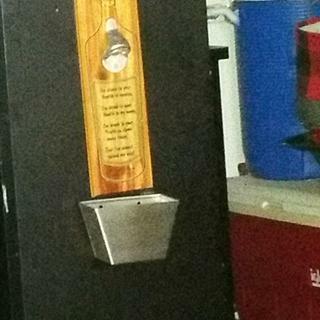 Every bar needs a bottle cap catcher. Easily lifts up to empty. Compliment your wall mounted bottle opener! Install one of these handy cap catchers underneath to keep the caps from falling to the floor. Made of stainless steel. Well worth $6.49 for sure! I am too cheap to pay regular price but it definately worth $6.49! It is well made and high quality! Even has mounting screws. The stainless steel bottle cap catcher is a great product and lives up to the product description. I can't wait to install it on my outdoor bar as soon as the weather permits. Very heavy duty and well worth the price. Purchased this to complement my wall mount bottle opener. It was the finishing touch for my kegerator. The item is well made and looks good. I think it's a little pricy, but I guess you get what you pay for, especially in this day and age. It's nice. I attached it to the refrigerator with some velcro that I had and it's working out very well. It works okay but it needs to be bigger. The screws are also too short unless you want to take them out every time you need to empty the catcher. I used longer screws so there is enough metal it the post to keep it secure and negate the need to remove them. Poor quality cheap and not even a shiny stainless. Couldn't even use it for my project. Very disappointing! I had to buy another one from a different vender. Thank you for your feedback. We're sorry to hear that the quality of the cap catcher wasn't as expected. If you haven't already please call us at 877-636-3673 or email us at customercare@kegworks.com so we can assist you further. Cheers! Very easy to order and a great price for just what we wanted. Because they dont rust out in the salt air by the ocean. saw the advert in Outside magazine. Compared prices and you were the best around. Great way to keep loose caps under control. But they are usually kinda pricey, seeing the flash sale allowed me to buy 4 for the price of 1! Cap catcher under bottle opener for boat. Stainless matches other galley equipment. required for quick open ! It is just what I wanted. Simple, but well made. Good design price is right. I live in a area that is like living on a boat,you need stainless here,just hope this is good stainless. It looks to be the right size, it's stainless steel, and the price was right. There are not many choices for this item. I like the stainless steel. It will last a life time and look good for a long time. It doesnt rust down here at the beach. Just what we needed. Good quality, so I bought more. I needed it and it will (hopefully) fit where I have my bottle opener next to the refrigerator in the garage. it appears to be of good quality and the stainless seeel is a bonus for outdoor use. I needed it. I already have the wall mounted bottle opener and can't always catch the caps before they hit the floor (especially after the 5th or 6th beer ;-) and the wife doesn't like when I leave them on the floor. I'm hoping it will fit the need. I needed the item and saw a good sale price on it! It's a good idea to have a "catcher for the rye', barley and wheat" than to spend the following day after a party picking up hundreds of beer caps !!! Stainless steel, the only way to go, matches the grill. This is a gift and the sale price was perfect. I purchased it along with the outlet opener. To catch bottle caps in the kitchen, so my wife can stop yelling at me.